business power tools, spiritual guidance, and a #girlgang to back you up while you slay your sales goals. Save yourself the time and effort of building a sustainable business without breaking your piggybank, a personal cheerleading squad, and tools to make life that much easier. The Idea Girl Gang Membership provides you with quarterly courses, business resources, and spiritual guidance to support your glow-up professionally, financially, spiritually, and mentally. Learn how to make your bright ideas shine by solidifying your business strategy, laying down the foundation and getting the ball rolling by taking action! This course is perfect for entrepreneurs, solo-preneurs, small business owners, freelancers, and seasoned girl bosses looking to shake sh*t up whether you’re in idea stage or scaling your biz! Each quarter you will receive a monthly curriculum of knowledge, tools, and resources to help your brand gl(r)ow from the inside out. Every 3 months you will learn how to build, automate, manage, and operate your business, grow your network, and increase your networth at the same damn time (plus a bunch of other perks!). GETTING YOUR BIZ IDEAS OUT OF YOUR HEAD AND INTO YOUR POCKETS. Learn how to start the brand you’ve always wanted and get glowing in the right direction all the while discovering your brand strategy and competitive edge. Discovering your target audience and how to land the customers of your dreams with the right tools to build a loyal clientele. Securing a stress-free bag with strategies, contracts, proposals, and a plethora of apps to run your business for you as you stay productive, not busy. Learning how to tap into your magic to create peace, balance, and cash with a spiritual mentor during a live monthly webinar. Navigate the ins-and-outs in all things money and legal related with your financial mentor during a monthly webinar.  + Discount tickets to Links & Lattes, our co-werking event series in major cities like NYC, DC, ATL, and LA. + First alerts on job openings and events. + IRL invites to hang with Britt at #GIRLGANGNITEOUT to dinners, theaters, and art galleries at prices that won’t break the bank coming to major cities soon! enrollment for Q1 is now closed. Oh snap! Enrollment for Q1 is officially closed, but don’t fret we are opening enrollment for our Quarterly Membership plan on 3/15/2019. Get ahead of the game by applying in advance until our next session starts! *all applications are to be approved by our team for qualification. Once accepted, there is a grace period to select the membership that works best for you. If a membership plan is not selected 24 hours prior to the enrollment end date your application approval will expire and you will be prompted to enroll for the next quarter. 3-month commitment membership billed once every three months. Enrollment opens on a quarterly basis. 6-month commitment membership billed once every six months. Enrollment opens on a bi-annual basis. 1-year commitment membership billed annually once a year. Enrollment opens on an annual basis. *SORRY GIRL, All sales are final, no refunds are permitted ON ANY MEMBERSHIP ONCE YOU COMMIT TO a PLAN. ALL MEMBERSHIPS CAN BE CANCELED AT ANYTIME AT YOUR CONVENIENCE. not ready to commit to your exclusive #girlgang membership? Get notifications on job alerts, events, and creative content for $FREE.99! Take progress into your own hands with à la carte courses and werksheets. have a question? browse our faq! + WHO IS THE #IDEAGIRLGANG MEMBERSHIP FOR? This membership is for creative black women in business who are small business owners, solopreneurs, freelancers, and entreprenurs who work as web/graphic designers, consultants, photographers, copywriters, public relations, interior designers, event planners, influencers, bloggers, cosmeotolgists, and other service-related industries. Enrollment dates for quarterly memberships open every 3 months, meanwhile bi-annual membership enrollment opens every 6 months for quarters Q1-Q2 and Q3-Q4. The annual membership enrollment opens once a year for quarters Q1-Q4. Our courses have limited seats so don't wait to sign up! + WHAT IS YOUR MEMBERSHIP APPLICATION PROCESS? + WHAT HAPPENS IF I MISS A QUARTERLY COURSE? If you end up missing out on open enrollment for the CourseWerk! quarter, you will have the option to purchase our quarterly sessions à la carte after the course is live (coming soon). + CAN I TRY OUT ONLY ONE MONTH? Being that our courses occur quarterly we only have 3, 6 or 12-month commitment options. If you want a taste of our curriculum you can purchase werksheets à la carte after the course is live (coming soon). + When does my membership get renewed? Your membership is automatically renewed on a quarterly, bi-annual, and annual basis depending on your membership from the date of your original signup. + Do you offer refunds on courses or memberships? All memberships and courses are final sale and cannot be refunded. + When will the webinars take place?? The webinars will take place on either Saturday or Sunday afternoons. Members will get notification of final webinar dates apart of the course syllabus. + What if I miss a webinar?? No worries, all webinars will be recorded and uploaded the following business day in your membership portal. + When will I receive my course materials? ? You will receive your worksheet monthly worksheet the day the quarter offically begins. + CAN I CANCEL MY #IDEAGIRLGANG MEMBERSHIP? We'd hate to see you go, but because things happen you can cancel your membership at anytime. Once your membership is canceled you will lose access to all #ideagirlgang platforms and werksheets but you will still have access to our newsletter.